Thanks for stopping by on this wonderful Thanksgiving day! 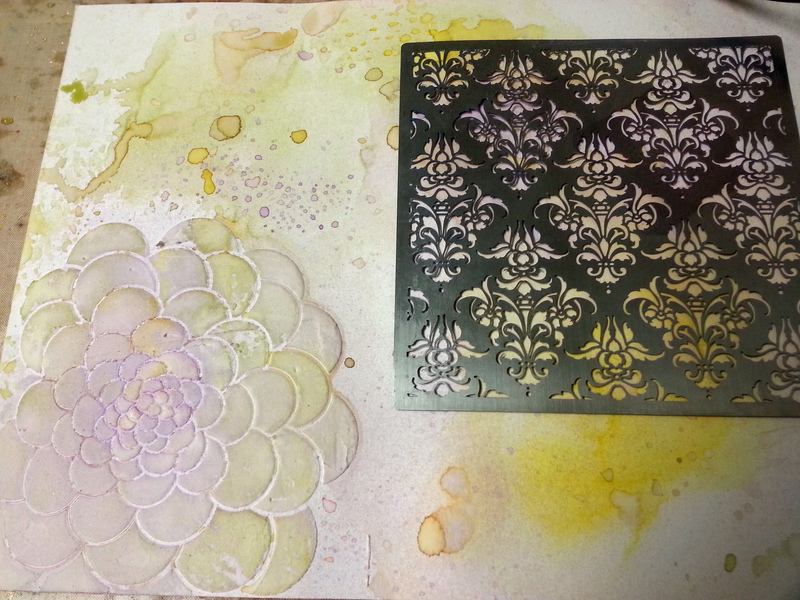 This is my last post as guest designer for Dreamweaver Stencils this month. I enjoyed my stint this month and had so much fun playing with Dreamweaver Stencils. The Dream Team challenge you to be especially “Thankful and Thoughtful” during this month. Link your creations with this theme in mind on the Dream It Up! 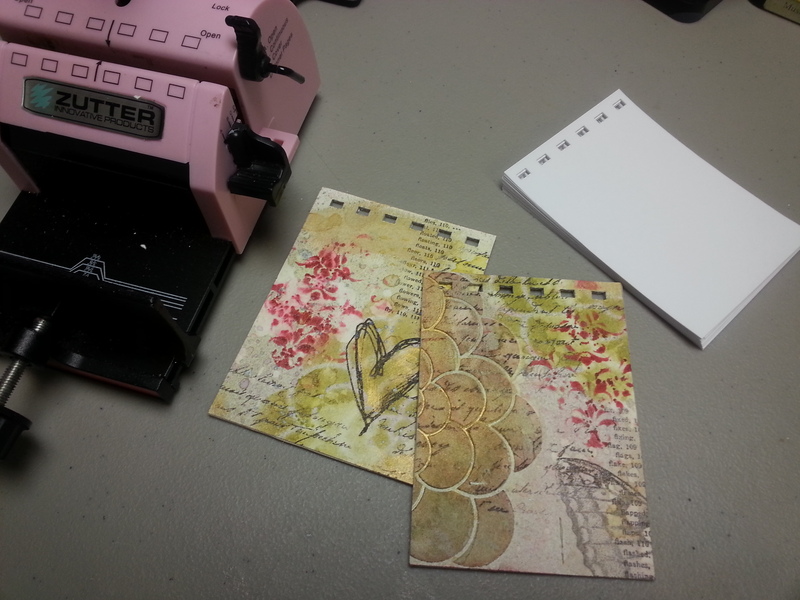 blog using the Inlinkz tool and you could win the stencil of your choice. 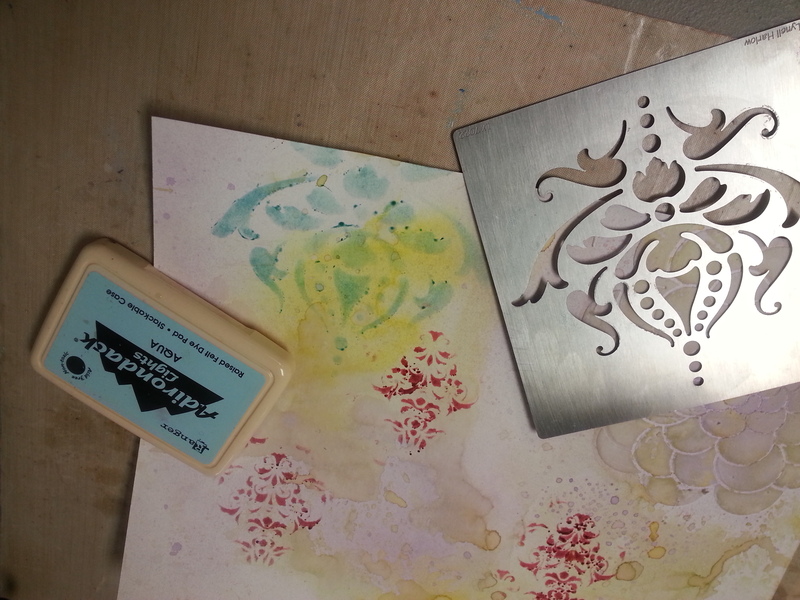 A bonus stencil of our choosing could be yours for using Dreamweaver product(s) in your artwork. 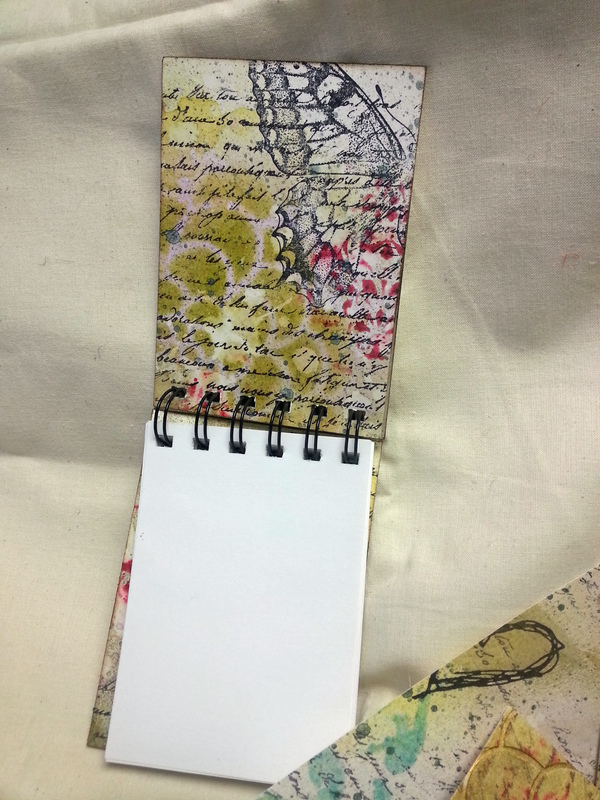 Today I want to share a technique to make another art journal background, but this time we’re going to cut it up and make mini notebooks from it that will fit in your purse or pocket! How cool is that – and just in time for gifting. 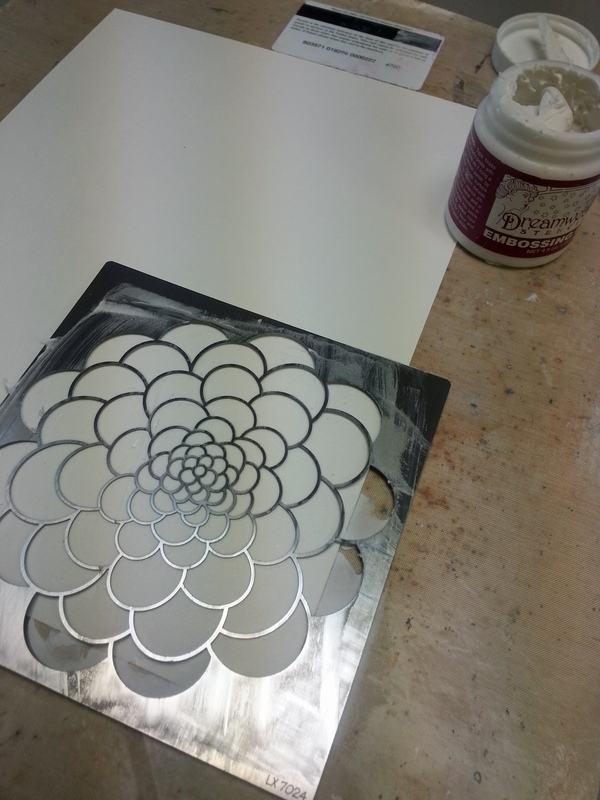 I started with Dreamweaver embossing paste, this beautiful Zen Flower Stencil and watercolor paper. After my paste dried I colorized the background with Ranger’s Distress Inks, dried and continued to dip and spray until the color was just as I wanted. I added more color by rubbing in some Adirondack Dye Ink using another Dreamweaver Stencil, Tapestry, that is a big favorite of mine. After the Tapestry Stencil I used some Aqua ink and rubbed it through Dreamweaver Stencil, Vintage Decor (click here to see how I used this stencil to turn an old drawer into beautiful home decor storage). 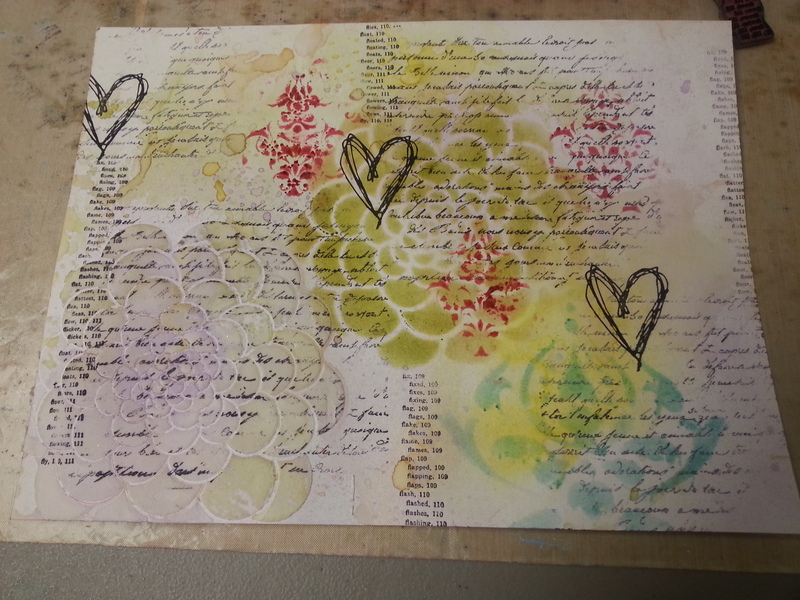 I added some images and text with rubber stamps then more color sprays and blotting to get this final look. 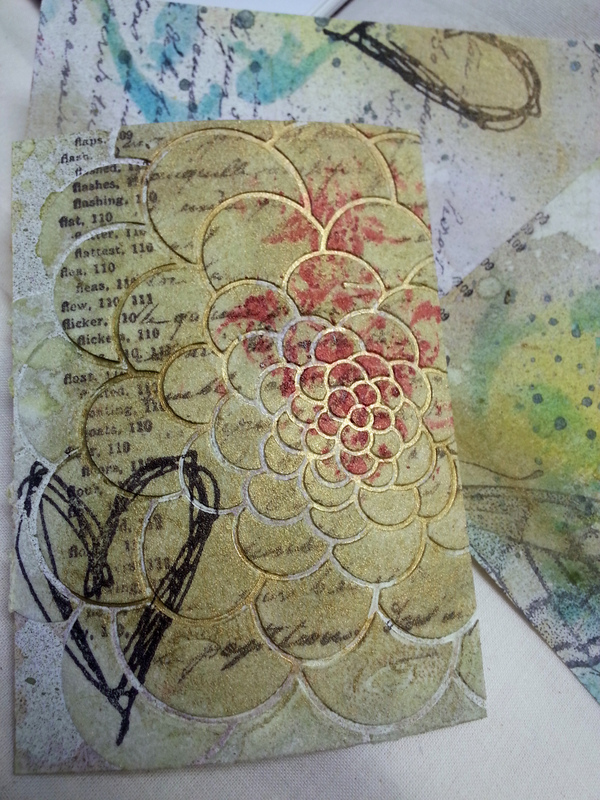 This turned into a beautiful art journal page but I’m still cutting it up! 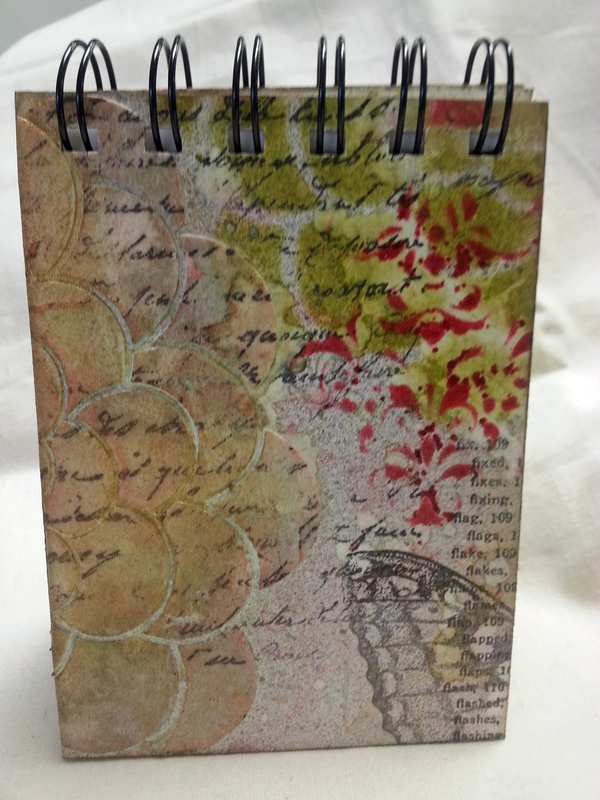 The art journal page is used to cover salvaged chipboard. 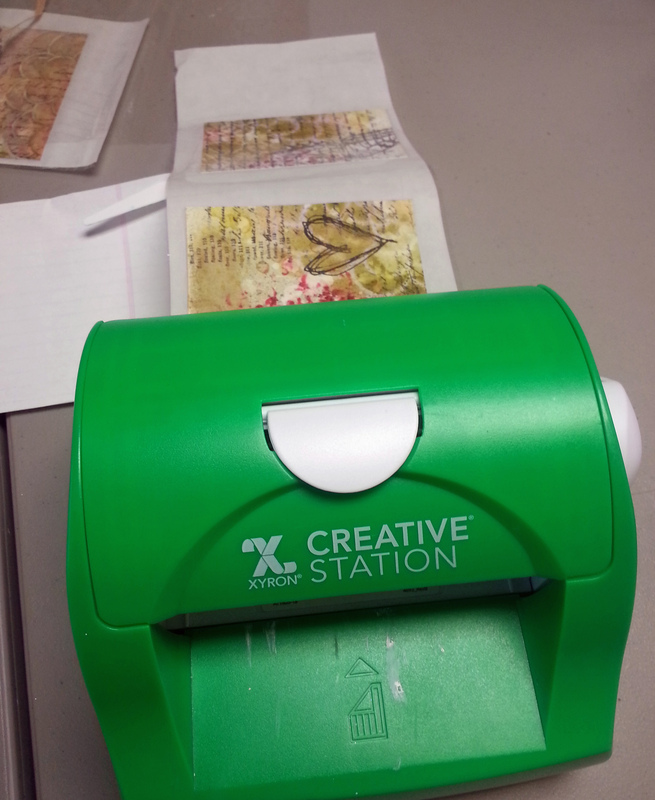 I connected the two by running the journal paper through my Xyron 5″ Creative Station, stuck it to the chipboard and used another journal section to cover the inside and the back cover as well. Once the covers were covered I punched the binding holes with my Zutter. The inside pages were cut about 1/8″ smaller than the cover on both sides and bottom. The covers are so pretty – I really enjoyed this project. I gave no thought as to how they were cut, I just cut them to a size I wanted to use. Once bound they make a perfect little stocking stuffer, thank you gift or something pretty to keep for yourself! Linda…this is wonderful…I have really loved all of your Dreamweaver creations this month, so inspiring. Thank you for all of your creative energy coming our direction..it means so much! Thanks, Lynell! It’s been a real treat! I just became acquainted with Linda and the Dreamweaver stencils. The stencils are wonderful as is Lindas use and techniques. Looking forward to more of both. That is beautiful! It looks so dimensional and I love the colors you used. What a wonderful gift idea! Love all of the details! Thanks so much for sharing and inspiring with us!